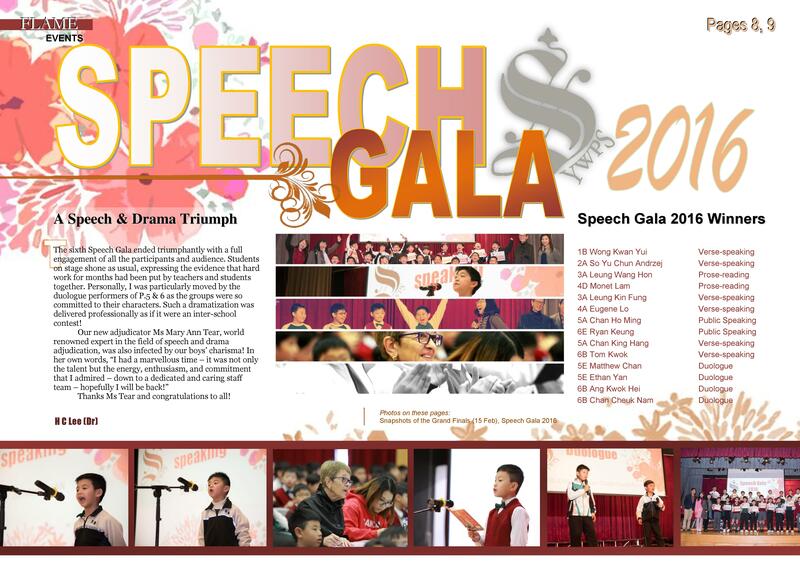 "Speech Gala" is Ying Wa Primary School's annual school-based speech and drama contest. It involves solo verse speaking, prose-reading, public speaking and, newly added in 2015, duologue. Students learn the set pieces during regular English lessons where they will perform for a place in the Finals. An external speech and drama expert adjudicate the Finals with Headmistress. 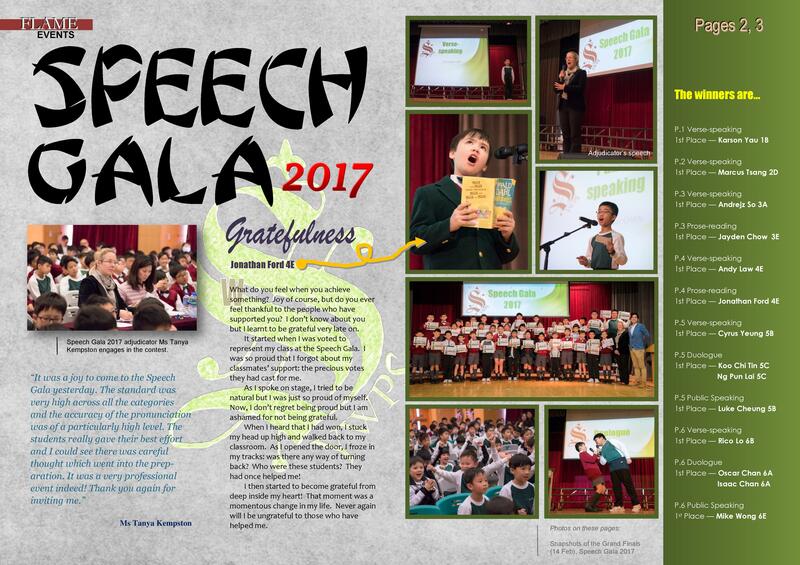 It all started in 2010, towards December when the Panel Chair of our Department, H C Lee, discussed with the Department Adviser of that time, Simon Tham, on how the school could sustain a language arts atmosphere in school after the Speech Festival. 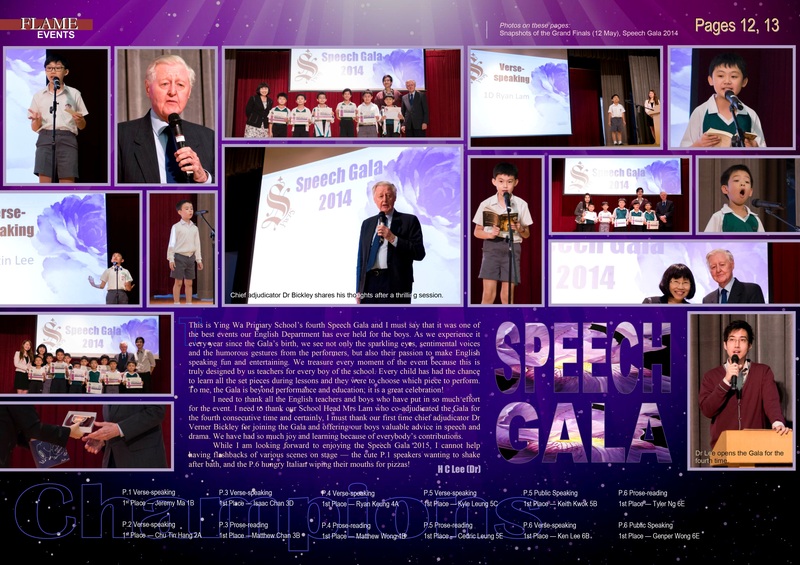 Mr Tham suggested that we have our own version of the Speech Festival which involved the entire school of students. 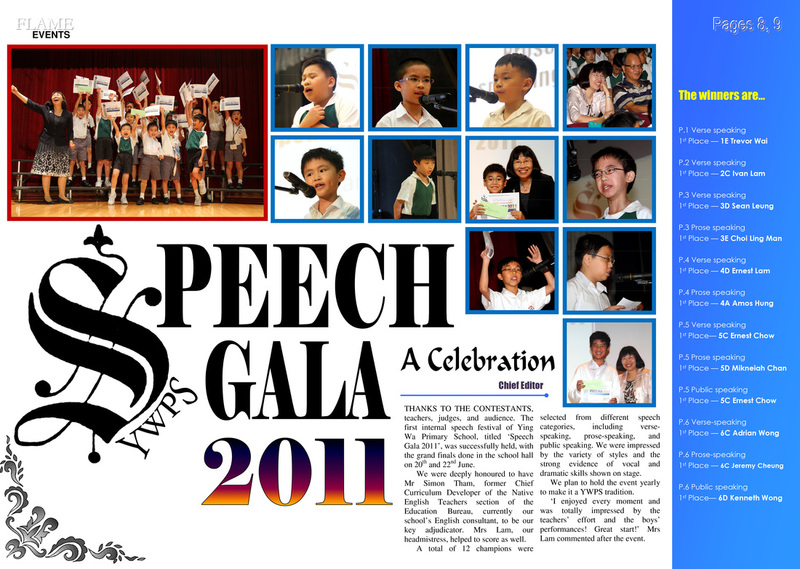 He named it "Speech Gala" during the time when the event was taking shape and provided a lot of professional advice on how it should be run. Mr Tham also adjudicated the first two Galas. All boys from YWPS have automatically entered the competition. The English teachers teach the set pieces and the students will get to choose which category(ies) to enter. 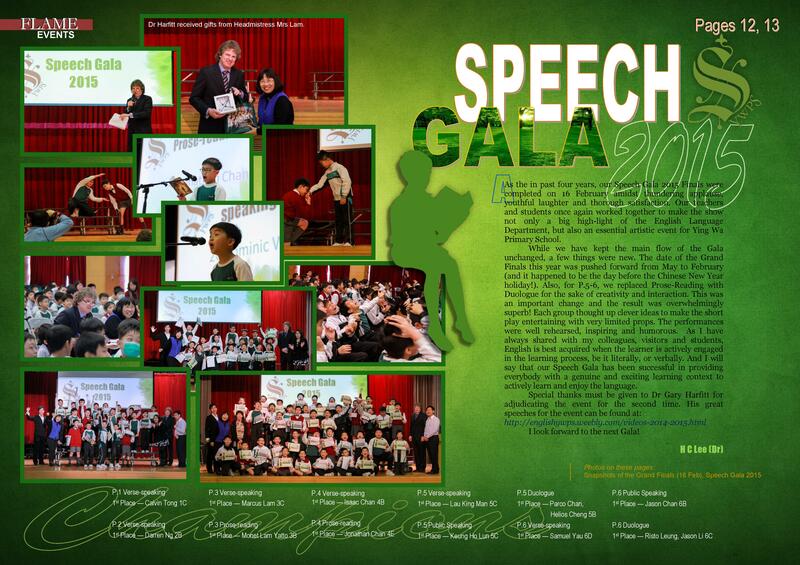 As of 2015, the competition categories include verse speaking, prose reading, duologue and public speaking. While poetry recital is for all levels, prose reading is for P.3 to P.4 and, duologue and public speaking are for P.5 and P.6 only. The preliminary rounds are done in regular English lessons, adjudicated by the English teacher who selects a finalist for each category for the Grand Finals held in the hall. An external speech and drama expert chairs the adjudication of the finals along with the School Head. All finalists receive a certificate and the winners in the finals receive a book coupon. 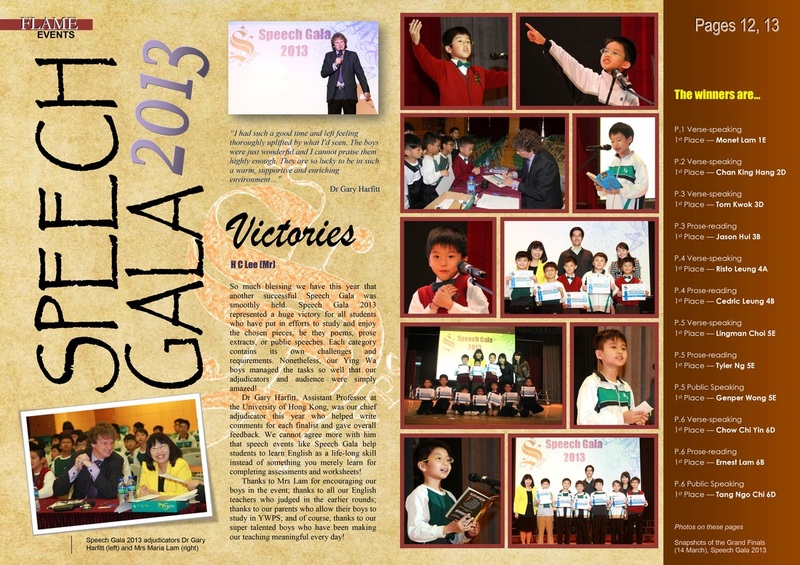 Captured in different issues of FLAME Magazine are the joy and excitement of each year's Speech Gala. The specific pages that have reported the event are displayed below. Simon Tham Sheon-ming is currently an English language consultant and Speech Festival Adjudicator. Before his retirement, he was an English Literature teacher at secondary school level, the Principal Inspector of English in the Advisory Inspectorate Division of the Education Department, as well as the Head of the NET Section of EMB. 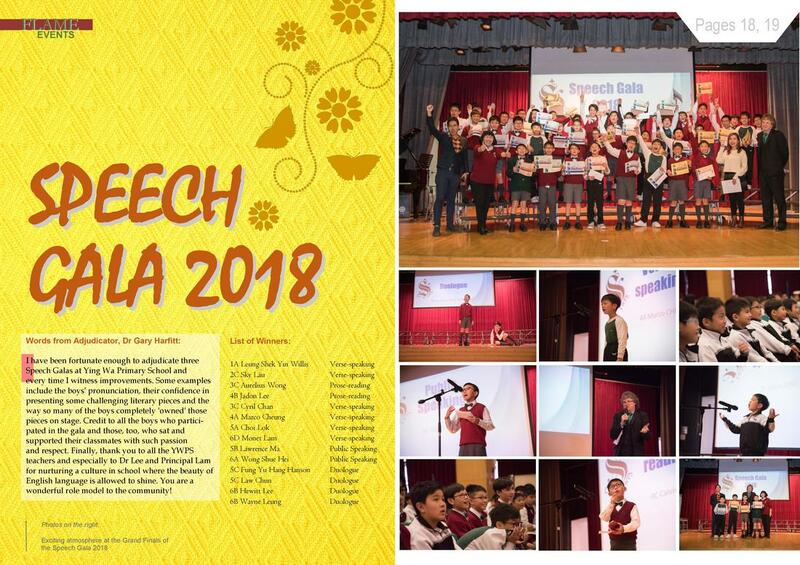 Tham is an experienced speech and drama adjudicator and has written a booklet and produced a video on “The Teaching of Choral Speaking”, and “Good Practices in Speech Activities” which were distributed to all primary and secondary schools in Hong Kong. Tham also frequently conducts talks and workshops on the subject for both primary and secondary English teachers. 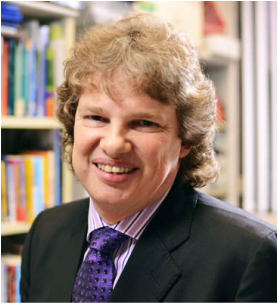 Dr Gary Harfitt is currently an Assistant Professor at the Faculty of Education at the University of Hong Kong. He is an award-winning teacher-trainer both at undergraduate and graduate levels. He has widely published in academic journals and published textbooks on teaching and learning poetry. Dr Harfitt has a wide range of research interests including the use of poetry and language arts in the English Language classroom. Moreover, he has been actively involved in community services, including adjudicating the Hong Kong Schools Speech Festival since 2002, as well as drama, debate and speech competitions at different schools in Hong Kong. Dr Verner Bickley is a writer, author, publisher, educationist, cultural administrator and speech and drama performer. Until very recently, he was an Honorary Research Fellow at the Centre of Asian Studies (CAS), now renamed, “Centre for Humanities and Social Science (incorporating the Centre for Asian Studies”, University of Hong Kong, He is a Sector/Subject Specialist for the Hong Kong Council for Accreditation of Academic & Vocational Qualifications. He is Chairman of the Executive Committee of the English-Speaking Union, Hong Kong. For a number of years he was Chairman of The Royal Commonwealth Society, Hong Kong, and remains on the RCS Committee. With his wife, Gillian Bickley, Verner Bickley is co-Director of the independent publishing house, Proverse Hong Kong, and co-Founder of The Proverse Prize for unpublished writing. Ms Mary Ann Tear is a BIFF adjudicator as well as a Trinity College London senior examiner and she is their Drama and Performance Consultant for SEA based in Singapore. She is a choreographer, director and Performing Arts lecturer. All this work has taken her to Malaysia, Thailand, Indonesia, Vietnam, Australia, New Zealand, South Africa, Hong Kong, India, Sri Lanka, Canada, as well as many UK and European centres. Whilst enjoying the examining, adjudicating, directing, choreographing, and lecturing Ms Tear has also found time to read, listen to music, to go to the theatre, visit art galleries, and watch the latest films, believing that it is so important to be up to date with movements in the contemporary arts scene. She also enjoys spending time with her family and friends in Singapore. Ms Tanya Kempston has worked as an English teacher in Northern Ireland and Japan before moving to Hong Kong in 2001. She was awarded a Master’s Degree with Distinction in Drama and Theatre Education by the University of Warwick in the UK in 2006 and is currently a lecturer in the Faculty of Education at the University of Hong Kong with teaching and research areas including ELT Methodology, Drama in Language Learning, Literature in Language Learning, Children’s Literature, Child Development etc. Ms Kempston has adjudicated the Hong Kong Schools Speech Festival for many years.